Cleo feels overwhelmed because all that is expected from her. She is also sad since she doesn't seem to fit among her peers. Is in these moments that she sails to explore and conquer her imagination, bringing with her only her cat Amadeus. She visits many places, and somewhere she meets a boy who becomes her friend. He is not an imaginary friend, but another dreamy kid who found Cleo in some magical land. They fight monsters and face storms. They tell stories to the sea animals and climb to the sky. And they keep company to each other when the magic trip comes to an end. 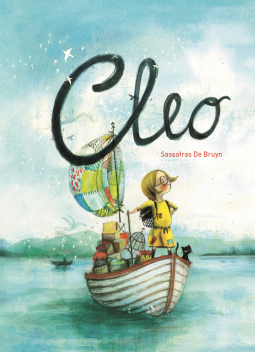 Cleo's story is touching, and I am sure many kids will relate with her experiences. The illustrations are incredibly beautiful. The only thing that prevents me of giving this book 5 stars is the font, which I found hard to help kids to read. I am eager to check for more of this author's work.